ed. by William J. Moir. Indianapolis: B. F. Bowen, 1911. One of the well remembered and worthy pioneers of Iowa Falls and for many years one of Hardin county's well known and progressive citizens was Jeremiah T. Lane, familiarly known as "Jerry" Lane, a man who is remembered as the possessor of many sterling qualities of head and heart and whose efforts resulted in much good to the general public. Mr. Lane was born in western New York, February 21, 1828. He was the son of Samuel and Bedelia (Sargeant) Lane, who were the parents of seven children, namely: Jeremiah T. (of this review); Charles; Polly died in infancy; Polly (the second) married John Rinehart, a sketch of whose son, John M. Rinehart, appears on another page of this work; Sally died January 11, 1886, and was the wife of Edward Mark, deceased; Emily is the widow of A. A. Jackson, deceased; Harriet B. died in infancy. While the subject was a small child his parents moved to DuPage county, Illinois, where he lived until 1855, when he came to Hardin county, Iowa. The year following his mother and sister Emily came, the father having died in Illinois. For a number of years Jerry Lane conducted a hotel in a double log cabin on the corner of Main and Iowa streets, Iowa Falls. This was one of the first hotels in this section of Iowa. It was liberally patronized and for several decades was popular with the traveling public, and here many an adventurer, fortune-seeker, home-seeker, politician and others gathered from time to time. It was not unusual for twenty or twenty-five men to wrap themselves in blankets and sleep in the somewhat open and airy upper chamber, even in the coldest weather. The hard work and long hours in the hotel impaired Mrs. Lane's health, so they quit this business and bought a farm northwest of Iowa Falls where they lived a number of years. Selling that place, they bought another, now occupied by Bruce Grant. 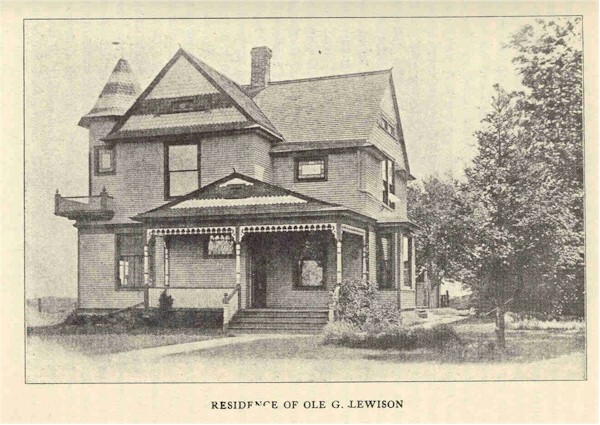 Mr. Lane lived here until he moved back to Iowa Falls in 1889. Here he remained until 1901 when he went to live with his daughter at Jennings, Louisiana. After moving to his first farm he occupied himself for a number of years, in his spare time, hauling freight from Dubuque to Iowa Falls. He was also engaged for awhile in boring deep wells all over this part of the country, the machinery being operated by horse power. For many years he was a constable in his township and also in Iowa Falls, and all business entrusted to his care received prompt and careful attention. Mr. Lane built the first house of pine lumber in Iowa Falls, in 1856. He hauled the lumber from Dubuque with an ox team. 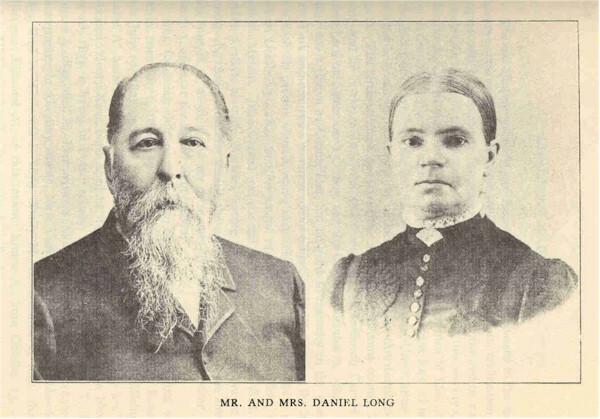 Mr. Lane and Phoebe Ackley were married in DuPage county, Illinois, in October, 1846, and to this union five children were born, four sons dying early in life, and a daughter, Mrs. J. H. Hemen, together with his wife and one grandchild survive, his death having occurred on February 16, 1911, at Jennings, Louisiana. Mr. Lane was a man in whom everyone reposed the utmost confidence, for his word was to him a sacred obligation and he was always ready to assist in any good work or help those in need. He has a wide acquaintance throughout the northern part of the county especially. It is said of him that he would loan his neighbor a horse and walk rather than have a friend suffer. The early life of Stephen Eugene Lathrop, one of Hardin countys progressive citizens, was spent in such a manner as to develop a strong, independent and sturdy manhood and a frugal and thrifty mentality which is very largely responsible for his subsequent success in life. Prosperity seems to have attended every worthy effort he has made, with the result that before the evening of life advances upon him he finds himself and family very comfortably situated, and the future, whatever it may have in store for him and his, inspires no shadow of fear in his breast. Mr. Lathrop was born near Muncie, in Deleware county, Indiana, May 14, 1852. He is the son of Ichabod and Catherine (Humphrey) Lathrop, who emigrated to Iowa in pioneer times and entered the first land in Etna township, in section 34, the same section in which the town of Abbott was later built. The place consists of one hundred and eighty acres and is still held by the family, having never been in any other hands since the government deeded it to the elder Lathrop. Here he became well established through hard work and good management, becoming on of the substantial and well-known men of his times, and he continued to live on the homestead until his death, on August 13, 1896, on his eighty-second birthday. His widow made her home with the son, Stephen E. of this review, until her death, in July, 1897. Ichabod Lathrop was born in Genesee county, New York, on August 13, 1814. His father, Isaac Lathrop, was born in Connecticut, and his mother, known in her maidenhood as Lois Sawyer, was born in New York. In 1818 the family moved to Jefferson county, Indiana, and on to Illinois in 1822, being pioneers of those states; then, in February, 1823, the mother died, leaving ten children, of whom Ichabod was the youngest. He returned to Jefferson county, Indiana, and lived with his brother, Lyman G. Lathrop, until 1833. Later he went to Tippecanoe county, that state, and in 1836 married Catherine Humphreys. In 1839 they moved to Muncie and from there, in 1853, they moved to Iowa, bringing their earthly belongings overland in an old-fashioned covered wagon. When Stephen E. Lathrop was one year old his parents brought him to Etna township, Hardin county, Iowa, near where the village of Abbott now stands, thus making him one of the first settlers of this locality, and here he grew up on his fathers farm, which he worked on when he became of proper age, and here he has been content to spend his life. He enjoyed the advantages of a liberal education, having passed through the local common schools and Cornell College at Mt. Vernon, Iowa, where he finished the normal course, also the business and commercial course. Thus well equipped for his life work, he taught twenty-one terms in the home school where he was reared, the only common school he ever attended and the only one he ever taught in Hardin county, the Hazel Green school at Abbott. He also taught ten terms in Grundy county before teaching his home school. He became known as one of the leading educators in this section of the state and gave eminent satisfaction both to pupils and patrons. He began farming while teaching and continued agricultural pursuits successfully until 1907. He then spent a year with Mr. and Mrs. W. F. Clover, traveling in Idaho and California. Returning to Hardin county, he bought a home in Iowa Falls and has remained here ever since. Mr. Lathrop was married on October 2, 1884, to Elizabeth Wilson, of Traer, Iowa. She was born at Plainfield, Will county, Illinois, the daughter of Andrew and Mary Wilson, natives of Ayreshire, Scotland, from which country they emigrated to America in 1842 and located in Illinois, moving to Traer, Iowa, in 1865. They were highly respected and energetic, and Mrs. Lathrop is a lady of many praiseworthy characteristics. Besides his interest in the old home, Mr. Lathrop is the owner of two hundred and fifty acres of valuable and well improved land adjoining Abbott. He and his wife have no children. They are members of the Methodist Episcopal church, he having been affiliated with the same since early in life. Fraternally, he belongs to the Modern Woodmen. Mr. Lathrop is a genial and companionable gentlemen, well liked wherever he is known. He has kept well abreast of the times on all current subjects and is familiar with the worlds best literature. He enjoys the distinction of being the oldest settler in Etna township now living, and there are very few who have lived in Hardin county as long as he has, although he is now merely at the threshold of old age, being still hale and active and apparently a man of middle age. His sister, Elizabeth H. Lathrop, now makes her home with him. She taught school from 1864 to 1881, and also attended school during that period and secured a first class certificate. For the past twenty-two years she has been blind, but bears her misfortune most bravely and with rarer fortitude than is commonly seen. She was a very successful teacher and is a woman of high intellectual attainments. A brother, Warren D. Lathrop, lives at Cherokee, Iowa; he is married, as is also Martin Lathrop, who is the owner and operator of a good farm near Trenton, Missouri; H. B. Lathrop lives at Marshalltown, Iowa. One of the largest land owners and best known stock raisers of Hardin county is Thomas Lawler, of Providence and Pleasant townships, whose career has been an example of unremitting success in his occupation, where his shrewd business ability and the keenness of mind, which is a characteristic of the Irish race, have enabled him to rise to the present leading position which he holds in his community. He was born August 28, 1854, at Peoria, Illinois, the son of Patrick and Anna (Sullivan) Lawler. Patrick Lawler was born in Wexford county, Ireland, the son of Thomas and Mary (McGrath) Lawler, who, as well as eight of their nine children, spent their lives in Ireland. Patrick learned the mason's trade in England, and came to America when twenty-seven years old, arriving at New Orleans on July 4, 1850, after a sixteen weeks' voyage. He and his wife went to Peoria, Illinois, and after a short stay there came by wagon to Hardin county, Iowa, where Patrick took up his trade and followed it during the remainder of his life. He built the foundation of the first school house at Secor and at Eldora load the foundations of some of the the first stores. Many of the foundations which he laid are still in service. He died as he had lived, in the Catholic faith, and was buried in the Catholic cemetery at Secor. He was an excellent workman, an honest and sturdy citizen who had many friends. His wife is now living. They were the parents of the following children: Mary Ann, who married James Dunn, who died at St. Anthony, Iowa, where his wife is still living; Thomas; Ellen, now Mrs. Kitrick, of Grundy county, Iowa; Katherine, deceased; John, who died at the age of one; Dennis, a farmer of Providence township; Stella, who married John Stecia, of Pleasant township, a farmer; Liza, who lives with her mother at the old home in Pleasant township; Clara, deceased; and Dan, of Ackley. Thomas Lawler received his education in the early schools of Hardin county, and first located for himself on his present home farm in Providence township. He began with a tract of forty acres, on which he had a shanty, and some land broken. He improved the place, and by hard work and good judgment in dealing has accumulated property until he now owns more than seven hundred acres, and has put up a large and commodious modern residence and good barns. He deals in cattle extensively and feeds largely for market, and has found this very profitable. Mr. Lawler has given little attention to politics, his business occupying the most of his time, and has never cared for office. 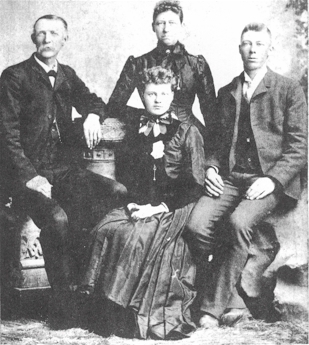 On April 18, 1881, Mr. Lawler was married to Mary E. McMahan, the daughter of Patrick and Mary (Smith) McMahan, natives of Ireland, who came to America and located in Wisconsin. They are both dead. To this union the following children were born: Frank J., William D., Catherine, a teacher, Nellie, a teacher, Clara, Emma, John, Edward and Irene, a family of young people of the highest character, promising much usefulness to their community. Thomas Lawler is a man whose genial good nature and ready wit have won for him many friends, while he is esteemed as one of the township's solid and substantial citizens, a man who has been successful in both the accumulation of property and in the formation of a strong character, and one whose judgment is much respected. The life of Joseph Lawless, well known, influential and highly respected citizen of Jackson township, Hardin county, has been one of signal usefulness and honor, and his memory links the early pioneer epoch, with its primitive surroundings and equipments, inseparably with the latter era of prosperity and achievement and conditions which have marked the advent of the glorious twentieth century. Mr. Lawless was born in the parish of Wicklow, townland of Coolinkilla, near Ashford , Ireland , in 1842. He is the son of James Lawless, who was born in the parish of Barnlarig , Ireland , in 1794. The latter's father, Mathew Lawless, was born in the same parish. The mother of the subject was known in her maidenhood as Elnor Madden, and she was born in the town of Arklow , Ireland , in 1804, the daughter of Andrew Madden; her mother's name was Murray, a near relative of Archbishop Murray, of Dublin . There were ten children in the family of James Lawless, namely: Mary, Mathew, John, Jane, James, Andrew, Lucy, Ellen, Joseph, of this sketch, and Augustine. The subject's paternal grandfather was a steward for a Quaker named Penrose. He was a �united� man in the rebellion of 1798 or what the English termed a rebel, and he was active in asserting his rights against English oppression. 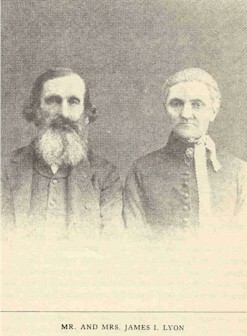 Mr. and Mrs. James lawless were married about 1822. After the death of the former's father, James Lawless succeeded him as Mr. Penrose's steward, later working for others in the same capacity. Later he took up farming, but times continuing hard, he finally emigrated to America with his family, the trip to New York on the old sailing vessel �Abyprat� requiring seven weeks. There the father and children were soon found remunerative employment, later returning to Ireland for the purpose of disposing of some of his wife's property in Arklow, after which he returned to New York , bringing the subject, who had been left in the home land, he being about five years old at that time. It was a trying voyage, many deaths occurring on the ship from plague, the trip requiring twenty-eight days. For a time after landing there was sickness in the family and they had a hard time. Later the father took his family to Beloit , Rock county, Wisconsin , where he found employment on the farm, digging wells and doing whatever he could to earn an honest living. He soon had a start in the new country, securing some good land where he established a good home and made a comfortable living, clearing and developing the land into a good farm, after undergoing the usual hardships incident to pioneer life in the north sixty years ago. In 1855 James Lawless added to his place by buying forty acres more and farmed successfully until he met death in a runaway accident, September 1, 1857, after which the subject and his brothers had to work hard to support the family and keep the farm up, Joseph then being fifteen years of age. The place being divided, he and his mother remained on one half of it. Joseph remained at home during the war, he being the only support of his mother. He worked in a butcher shop for some time and farmed some. His brother Andrew had gone to Nevada and returned home on a visit, and in the spring of 1864 Joseph returned to the far West with him, making the long overland journey across the plains in a wagon, there being several in the party. The trip was both a pleasant and eventful one, their experiences being somewhat trying at times, and it is very interesting to hear the subject relate the various incidents of this trip. He is a fluent conversationalist, and having always been a keen observer, his accounts not only of this trip, but of his voyage from Ireland to American, then from New York to Wisconsin along the route of the Great Lakes, are both interesting and instructive, bringing back as they do vivid pictures of pioneer days and conditions of another and much different period than that of the present. They arrived in Nevada the following summer, having been over four months on the way, and there they went to farming and were successful. After remaining in that state a few years, Joseph Lawless went into California and visited many different places in 1866. Boarding a steamship at San Francisco, he started, in the fall of that year, back to New York city, by way of the isthmus of Panama, which they crossed by train, then boarded the steamship �Arizona,� and proceeded up the Atlantic coast, landing in New York November 1, 1866, the entire trip from San Francisco requiring twenty-one days. Mr. Lawless and three other young men, whom he had met on board the ship, one bound for Wisconsin and the other two for Iowa , started West the following day, making the trip by rail and boat back to his old home near Beloit , Wisconsin . He spent the following winter visiting with his mother, now grown old, and with relatives and friends in that locality. Joseph Lawless had saved about a thousand dollars while in the West, which together with the proceeds from the old home place which was sold soon after his return, gave him sufficient capital to start up anew. He decided to make his future home in the state of Iowa, having been favorably impressed with the same upon his trip west, so he came to Hardin county, leaving Beloit, Wisconsin, March 1, 1867, but after visiting awhile in the southern part of the state he returned to Wisconsin somewhat discouraged, but soon afterwards he started again for Hardin county, Iowa. Here he purchased one hundred and sixty acres at three dollars and fifty cents per acre. He was pleased with the new country, and found numerous species of wild game and such conditions as one would expect to find in a new country at that period. He began improving his wild land and, by dint of hard toil and perseverance, soon had a good farm developed and a good home established, having in the meantime purchased five acres of timber near by. Hardin county was then practically all wild, only a few scattering houses here and there on the prairie, and there were practically no roads and few conveniences of modern civilization. But he in time had made preparation to bring his mother here, and begin the work of home building in earnest, Mr. Lawless having remained in Iowa until the latter part of 1867 when he went back to the old home for his mother. He remained among the kinsfolk until February 10, 1868 , and after a somewhat trying trip through the snow over the bleak, treeless prairies, they reached their new home. In time newcomers settled about them and the country was developed until today it has quite a different aspect, fine farms lying in all directions and elegant large dwellings standing all about. To the subject credit must be given for a full share in this work of transformation, for his bravery and courage in coming to a wild country and bearing its hardships and privations until it could be made to �blossom as the rose� and take rank, as it does today, with the best sections of the great Hawkeye state. Renting his farm about 1869, he took his mother back to Wisconsin and spent part of his time there and in Illinois , resuming work on his place in 1872. On August 15 th of that year Joseph Lawless was married to Mary Doll, in Ackley, Hardin county, by Father O'Dowd. She was born near Shannon , Illinois , on Christmas day, 1856. They began to keep house on their farm in October, 1872. 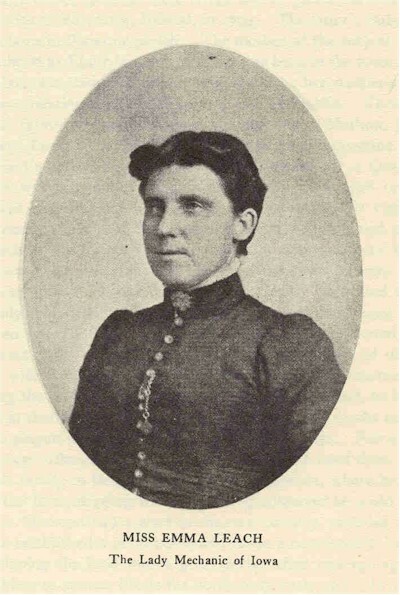 The mother of Mr. Lawless, to whom he was ever very much devoted, passed to the other world in March, 1873, and was buried in Beloit , Wisconsin , beside her husband, who has preceded her to the grave sixteen years. With the assistance of his young wife, Mr. Lawless was soon making money, and by thrift and industry added to his original place until he has one of the choice farms of the county, consisting of three hundred and twenty acres, which he has brought up to a high state of improvement and cultivation, and he has a beautiful home and substantial outbuildings. He has been very successful as a general farmer and stock raiser, having long been out of debt and had laid by for old age a comfortable competency. Four children have been born to Mr. and Mrs. Lawless, namely: James, born October 28, 1873 , is farming in this ( Jackson ) township; Joseph, Jr., born February 11, 1876, is managing the old home place, his father having retired from active farming; Bertha, born June 25, 1878, remained single, and died when twenty-five years of age; John, born July 4, 1881, married Jennie Sharpshear, and they are living on a farm in Jackson township. They all received very good educations in the local schools and are well situated in life. Joseph Lawless is a man whom everybody likes and respects, having let an exemplary and useful life, and he and his wife number their friends by the scores wherever they are known. The name which heads this review is one which is frequently heard in Union township, Carroll county, as that of a man who was a most excellent and capable farmer, having a true love for his occupation, by reason of which he was enabled to live a contented and successful life. He was not content to farm exactly in the same manner as all of his neighbors, but removed from the beaten path and devoted his energies largely to horticulture and the cultivation of orchard fruits. To be successful in fruit raising requires a degree of care and attention and a knowledge of the enemies of fruit growing which the average man is unwilling to give and to acquire, but Mr. Lepley became an expert in his line and the orchard in which he took so much pride was worthy to be an object of pride, not only to its owner, but also to the community. John Lepley was born on December 8, 1863, in Union township, Hardin county, Iowa, the son of Peter and Elizabeth (Hartinger) Lepley. He grew up on his father's farm, and on September 4, 1887, was married to Mattie Upton, the daughter of E. J. and Edna (Maltby) Upton, who were old and respected settlers of Eldora township. After their marriage Mr. and Mrs. Lepley lived for two years with his parents, for whom he cared during his declining years, living there for five years preceding his death. He died on July 27, 1908, a comparatively young man, but one who had lived a life of usefulness beyond his years. Mr. Lepley was a man who took much pleasure in his farming operations, and was one of the most careful and successful farmers of his neighborhood. He gave especial attention to horitculture and had on his farm a large orchard of fine and productive trees. Not long before his death he had built a convenient modern house. In politics he was a Democrat, in fraternal relations a member of the Modern Brotherhood of America, and, a true Christian in character, his affiliations were with the Christian church. He was a man universally liked and his death was strongly felt as a loss to the community. Mr. and Mrs. Lepley were the parents of eight children, to whom he was always a kind and loving father and in whom he took much interest and satisfaction. They are: Clarence Ebert, living on a claim in Dakota; Edna Elizabeth, who married Clayton Baker, of a pioneer family, now living in Eldora township; Horace Cleveland, Eugene Peter and Myron Sidney are at home; Howard, Morris and Ross are deceased. Mrs. Lepley is a lady of intelligence and ability, of a deep and true womanly nature, and is living with her family on the home farm. For many years George W. Lockard was a prominent and influential figure in the affairs of Union Township. A man of strong intelligence and good judgment, in whom his fellows trusted, and with the qualities of leadership well developed, he was active in the affairs of his community and used his influence in every way to further its development. His loss was deeply felt, not only by his widow, but also by his neighborhood in general. 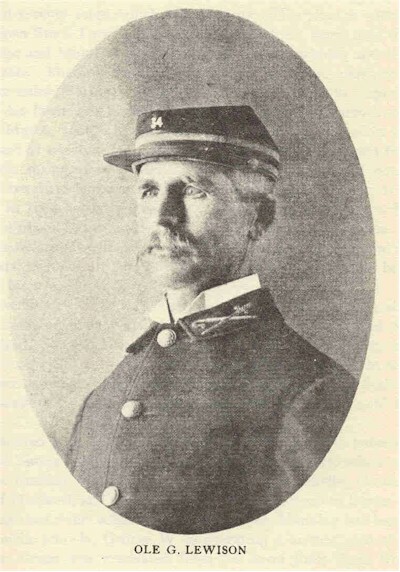 George W. Lockard was born in Champaign County, Ohio, on July 25, 1844, the son of William and Elizabeth Lockard. William Lockard was born near Williamsport, Virginia, on March 24, 1814, a son of Isaac and Sarah (Mills) Lockard, who later removed to Champaign County, Ohio. In the fall of 1851 William and his family left Ohio with teams, driving overland. They stopped in Benton County, Iowa, and remained one year and a half, then moved to Hardin County, at first living in a little log cabin with roof so low that they could hardly stand straight beneath, while the wife did the cooking for a large family on an old-fashioned fireplace. They improved the farm and reaped the reward of their labors and hardships in the bountiful crops obtained later and the increased value of their land. William Lockard*s family consisted of the following children: Mary Ann; John, who served in the Civil war in the Sixth Iowa Infantry, received a gunshot wound at the battle of Shiloh, and died en route home; Philander, a member of the same regiment, died with typhoid fever at St. Louis, Missouri; Philip; George, deceased, the subject of this sketch; Thomas, Isaac and Ira. George W. Lockard was reared on his father's farm and educated in the log cabin schools of Hardin County, after which he had a year and a half in Albion Seminary. On July 4, 1867, he was married to Jennie Hauser, the daughter of Hon. Thomas N. Hauser, mentioned at length in another sketch. She was born in Owen County, Indiana, on October 16, 1847. To this marriage two children were born: Nellie, born in 1868, and living at Kersey, Colorado, who married L. B. Tucker; Theodore Edwin, who married Ethel Parrish, and lives at Marshalltown, Iowa. After many years of useful life spent on the farm of Union Township, which brought to him his share of prosperity, Mr. Lockard died on September 5, 1906, at the age of sixty-two. Mr. Lockard was a member of the Christian church and a true Christian in character. He took exceptional pride in the education and development of his children. A staunch Republican, he held several township offices and was a trustee of Union Township for many years, being always faithful to the public trust. Such was the excellence of his life that in memory of his character alone he left to his children the most valuable of inheritances. The science of agriculture - for it is a science as well as an art - finds an able demonstrator as well as a successful practitioner in the person of Ira Lockard, who is widely known in southeastern Hardin County, maintaining a very productive and desirable farm in Union township. He comes of a highly honored pioneer family, members of which have played well their parts in the general development of this favored section of the great Iowa commonwealth. Mr. Lockard was born March 13, 1856, on the old home place where he still resides, section 10, Union Township, this county. He was educated in the schools of his native community, and in 1876 he was united in marriage with Rosina Jester, daughter of James and Mary (Fletcher) Jester, natives of North Carolina, who located in Providence Township, Hardin County, Iowa, in 1874, moving later to section 1, Union Township, later to section 15, where they spent the balance of their lives. They are buried in the cemetery at Union. They had a good home here and were highly respected. These children were born to them: Frank is deceased; Rosina, wife of Mr. Lockard, of this review; Columbus is deceased; Nettie is the wife of John Pope, of Union; Richard married Florence Woodward, and they live at Spirit Lake; Smith married Lydia Lawrence, and they live in Union. Seven daughters and one son have been born to Mr. and Mrs. Lockard, namely: Lillian married Calvin Newby, and they live in Union; Mabel, who married Clayton Hurley, died in 1909 when twenty-seven years of age, leaving one child, Irene, one other child having died in infancy; Ethel married Clair Carson, and they live in Union, Iowa; Josie married Clyde Rowen; Lois, Doris and Genevieve live at home. Mr. Lockard has been very successful in his business career. Besides his farm of three hundred acres, he operates an extensive cement plant at Union, the output of which is sent to customers covering a wide territory. In connection with the general farming he raises an excellent grade of live stock. He has kept the home place well improved and well tilled, so that it has retained its fertility. He has spent his life in his come community and has lived to see the wild, sparsely settled prairies round about transformed into fertile farms and dotted with pleasant homes. Politically, Mr. Lockard is a Republican and while he has always been interested in the advancement of local affairs he has not been an office seeker. He belongs to the Woodman lodge oat Union. Mr. Lockard is the son of William and Elizabeth (Steinbarger) Lockard, the father born in Virginia and the mother in Ohio. They came to Iowa in 1850, and to Hardin County in 1852, locating in Union Township on the farm Ira Lockard now lives on, where they died. The mother died November 19, 1890, aged seventy-five, and the father died January 16, 1894, aged seventy-three years. They were the parents of seven boys and one girl: John, who died from a gunshot wound at the battle of Shiloh; Philander died in a hospital in St. Louis from sickness contracted in the army; Isaac died in infancy; Phillip also died in infancy; George, dead; Thomas lives at Conrad, Iowa; Mary Ann, the eldest of the children, died at the age of fifteen. For many years the gentleman whose name heads this review has been identified with the milling industry in Hardin county, and during that time has acquired a wide acquaintance in the county and established a reputation as a square dealing man in business transactions. Frank M. Lockwood was born on the Lockwood homestead in Union township, Hardin county, Iowa, on October 19, 1861, the son of Lyman H. Lockwood, who was born in Franklin county, Ohio, on January 21, 1821, the son of Oliver and Lydia Lockwood, who were the parents of eight children. Oliver H. Lockwood, the grandfather, came to Marshall county, Iowa, in 1855, took up land there and improved it, living on it until his death, in 1872. Lyman H. Lockwood was reared on his father's farm, and at the age of eighteen he started to clerk in a store, remaining as such until he was thirty. On March 9, 1850, he was married to Theresa A. Tate, the daughter of Francis Tate, of Virginia. He came to Hardin county poor, but by good management accummulated a good amount of property, including a large and valuable farm, on which he had erected a comfortable home. He was a stanch Republican and a man of some influence in his community, holding several local offices, including that of justice of the peace. 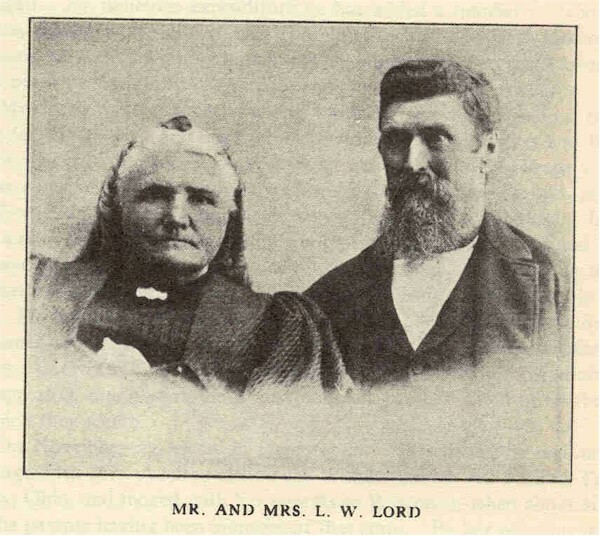 Lyman H. and Theresa Lockwood were the parents of the following children: Otis J., a fruit rancher and vineyard owner of Lodi, California, formerly of Union, and of Kansas; Ella, who married R. W. Sheets, of Canada; Eliza, deceased; Angie A., the wife of S. R. Spurlin, of Union township, mentioned in this work elsewhere; Florence, the wife of W. H. Galloway, of Hastings, Nebraska. Frank M.Lockwood attended the home schools, and was at Albion Normal for awhile, after which he attended Valparaiso University, at Valparaiso, Indiana, for a year and a half. After finishing school Mr. Lockwood entered the flour mill of H. J. Benson, at Union, and was with him at that place and Marshalltown for fifteen years. In 1892 he went into partnership with Mr. Benson at Steamboat Rock, and remodeled the mill there. This partnership lasted six years. While in the milling business Mr. Lockwood had made a wide acquaintance and gained a reputation as a careful man of business. In 1904 he was elected on the Republican ticket as clerk of Hardin county, and served from January, 1905, to January, 1909, by his official actions completely justifying the faith in him which the voters had shown by electing him to this office of trust. In 1908 he purchased the Benson Mills, located a mile east of Union, and has since operated these mills, doing a large and lucrative business in merchant milling. On December 23, 1883, Mr. Lockwood married Mary Holmes, who was born at Reeds Landing, Minnesota, the daughter of Joseph Holmes. To Mr. and Mrs. Lockwood two daughters have been born: Clara Lucile, who is attending normal school at Cedar Falls, and Gertrude Hester, who is attending school at Marshalltown, Iowa. Mr. Lockwood has taken a very active part in the councils of the Republican party of his county. Fraternally, he is a member of the Knights of Pythias and Modern Woodmen of America at Eldora. He is a man whose years of straightforward and honest dealing have gained for him the confidence of his neighbors, and have thus made him a man of influence in his community, while the geniality and affability of his nature make him welcome in any social gathering or group of men. Through struggle to triumph seems to be the maxim which holds sway for the majority of our citizens, and, though it is undoubtedly true that many fall exhausted in the conflict, a few, by their inherent force of character and strong mentality, rise above their environment and all which seems to hinder them, until they reach the plane of affluence toward which their face was set through the long years of struggle that must necessarily precede any accomplishment of great magnitude. Such has been the history of Edward H. Lundy, of Eldora, one of the leaders of the Hardin county bar and one of our most proressive and public-spirited citizens. Mr. Lundy was born near Union, this county, on July 3, 1871, the son of E. W. and H. L. (Morlan) Lundy, natives of Ohio, and one of the influential and honored pioneer families of Hardin county, Iowa, the father having come overland and settled here in 1856. He developed an excellent farm from the wild prairie near Union and he has lived in that community every since, becoming well established and well known as a leading agriculturist and stock man. The Morlan family also came in an early day and settled at Marietta, Marshall county, Iowa, and established a good home there. Four children were born to Mr. and Mrs. E. W. Lundy, namely: Mrs. Lelo Cromer, of Anamosa, Iowa, is the wife of E. A. Cromer, who has charge of the educational department of the Anamosa State Reformatory; John C. is farming near Union, Hardin county; Bessie married L. E. Butler, who has charge of the electric railway lines at Evansville, Indiana; Edward H., of this review, is the oldest of the children. Mr. Lundy was reared on the home farm, where he early learned the lessons of thrift and frugality and built up a robust constitution which has served him well in later life. He received his preliminary education in the Union high school, from which he was graduated in 1886. He then attended Albion Seminary, during its flourishing days, finishing the course there. He taught school very acceptably for two years, and while he found the work entirely to his liking he determined to cast his lot with the legal profession, coming to Eldora on June 2, 1893, and took up the study of law with Judge Allbrook. He was admitted to the bar in May, 1894, and has been in the practice here ever since, enjoying a large and ever growing clientele, and he has for some time figured prominently in the local courts, where he is regarded as a master of legal science in all its ramifications. The common law, the statutes of Iowa, the history, progress and growth of jurisprudence, as well as the higher and more abstruse principles of equity, all seem to be completely at his command. He is ever painstaking, vigilant and persistent and in the trial of cases he is logical, forceful and masterful. He has ever taken an abiding interest in public affairs and the general progress and good of his county, and is a loyal supporter of the Republican party. In 1895 he was elected county attorney and served two terms in a manner that reflected much credit upon himself and to the general satisfaction of the people, irrespective of party ties. He was in partnership with Judge Allbrook from July 1, 1894, to Octoer 5, 1909. He is now associated with George W. Wood under the firm name of Lundy & Wood, Mr. Allbrook having been elevated to the bench. Mr. Lundy has been engaged in much of the important litigation of the county. He was one of the attorneys for the state in the Blydenburg trial, also in the Winter trial, both murder cases. He also tried the case of Elzy vs. the Des Moines, Iowa Falls & Northern Railroad, one of the most important cases ever held here, judgment having been given for over forty thousand dollars. In the line of litigation his services have been on the side of the people rather than corporate interests. Mr. Lundy is the original organizer of the Co-operative Gas & Electric Light System in Eldora, a corporation with a capital stock of sixty thousand dollars, being on a purely co-operative basis, operating a gas and electric light system, Mr. Lundy being president of the company, and the pronounced success of this, one of the most beneficial enterprises Eldora has ever known, has been due for the most part to the wise counsel and judicious management of Mr. Lundy, who has proven himself to be a business man of rare discernment and keen acumen, always looking to the interests of the community in general while advancing his own. He has an elegant suite of offices, equipped with a carefully selected, modern and extensive law library, over the Hardin County National Bank. The domestic life of Mr. Lundy began on August 14, 1895, when he was united in marriage with Lula M. Rew, a lady of talent and refinement, the daughter of Joseph and Betsey Rew, both now deceased. Mrs. Lundy was born at Wautoma, Wisconsin, May 15, 1871, and she came to Eldora with her parents when five or six years old. This union has been graced by the birth of two children, namely: Lyman R., born July 7, 1896, and Lee L., born September 12, 1903. Fraternally, Mr. Lundy is a Mason, belonging to the chapter at Eldora and the Knights Templar at Iowa Falls; he also belongs to the Knights of Pythias. Personally, he is a very pleasant gentleman, genial, obliging, unassuming, honest and straightforward in all the relations of life, enjoying the confidence, good will and esteem of all classes. To an enterprising and resourceful man, a village or small town in a farming community offers many advantages in a business way. Competition is not so fierce as in a city, nor are rents and expenses so high, and though his customers are scattered over a large area, he may serve many more than an establishment of the same size in a city, while he is also prepared to serve a variety of wants and is not a specialist in a single line. The firm of Lyon & Hauser, of Whitten, have been eminently successful in satisfying the wants of the people of their community and building up a large and profitable trade. Howard A. Lyon was born in Whitten on July 22, 1872, the son of Robert Lyon, a native of Yorkshire, England, who came at the age of twelve to America with his mother, his sister Lucy and his brother Thomas, his father having died in England. They settled near South Wales, in New York, on a farm, and there the mother died. When Robert was twenty-one he came to Jackson county, Iowa, and in 1871 to Hardin county, and located in Union township, two and one-half miles north of Whitten on an eighty-acre farm, where he lived for several years, then moved to Union for three years, went back to New York for five years, and in 1901 came back to Union township, and moved to Whitten, where he died in March, 1901. He was married in 1856, in Jackson county, to Celestia Fuller, of New York, a daughter of Garrett and Lucy (Worborton) Fuller. Mr. Fuller was a farmer and blacksmith. His wife died in Jackson county, and he died in Tama county. Their children are Celestia, Emma, S. A. and W. H., of Toledo, Iowa, and H. G., who died in Pierre, South Dakota. Mr. and Mrs. Robert Lyon were the parents of five children: James H. was born in Jackson county, Iowa, in 1870, and, coming to Whitten, started as a clerk in Barnes' store, where he worked for three years, then started a store of his own, the firm later becoming Lyon Brothers. On October 10, 1907, he sold his interest in the store now owned by Lyon & Houser [Hauser]. He is still a resident of Whitten. He married Mary Ann Landis, who has borne him two children, Alta and Floyd. Garret F. was born in Hardin county, and is in the hardware and implement business at Toledo, Iowa. He married Ella Miller, of Jackson county, Iowa, and has two children, Robert and Earl. 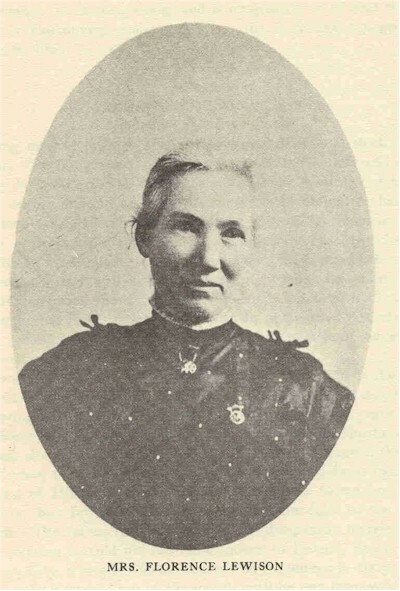 Hoveta married Dora Wilcox, and died on March 30, 1900. Howard A. is the fourth in order of birth. Lucy May died in Hardin county as an infant, eighteen months old. Howard A. Lyon was educated in the common schools, and for five years traveled in Iowa for the Deering Harvester Company. For two years he was in the grocery and restaurant business at Toledo, Iowa. In 1901 he went into the general merchandise business with his brother James H. at Whitten, and continued as a partner with Mr. Hauser when his brother sold out. Lyon Hauser are the proprietors of a well stocked store, which is kept looking neat, with goods well arranged for inspection, and carry everything usually found in a general store, while they make a specialty of rugs and carpets, shoes, rubber goods, paints and oils. The members are both hustlers and up-to-date in their management of their business, which has proven very profitable. On June 15, 1901, Howard A. Lyon was married to Viola McAnulty, the daughter of William and Maggie (Hill) McAnulty, of Toledo, Iowa. Her parents were natives of Pennsylvania and now reside in Toledo, Iowa. Mr. Lyon is a member of the Disciples church. He is a young man of prominence in the affairs of his community, widely known and well liked, while as a business man his success has been marked. Few men of a past generation in Buckeye township, Hardin county, left a more indelible imprint of their sterling personalities upon the minds and hearts of their friends and associates than the late James I. Lyon, a man who did much for the general good of the community honored by his residence. He was a man of exemplary character and his career might well be studied as a model by the youths whose destinies are yet matters for the future to determine. Mr. Lyon was born on December 23, 1827, in New York city, and he is the son of Abijah and Comfort (Holmes) Lyon, of Thompsontown, New York. In 1837 the family moved to Henry, Marshall county, Illinois, where the father purchased a farm and where he spent the rest of his days, his wife having died in New York. Their family consisted of four children, namely: Theodosia married William Williams and they are now both deceased; Rachel married Dave Snyder and they are both deceased; James I. of this review; Hannah is deceased. 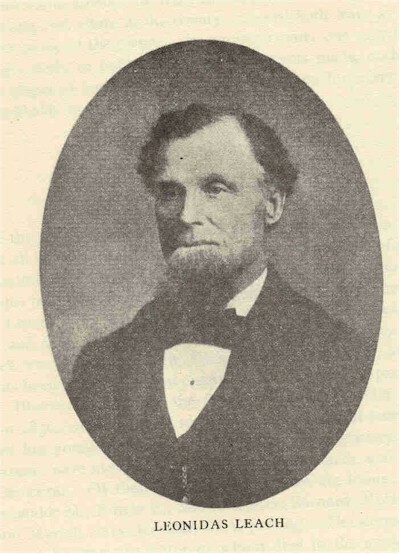 James I. Lyon grew to maturity on the farm and received his education in the common schools, remaining with his father until 1854, when he came to Hardin county, Iowa, and located in Buckeye township, entering the southeast quarter of section 2. He remained on this place about six weeks, then returned to Illinois, where he remained until 1866, then again came to Buckeye township, this county, and in 1867 moved on the farm where he spent the rest of his life, his death occurring on December 25, 1898. He was married in Bureau county, Illinois, on September 22, 1867, to Sylvia A. Wilson, who was born in Mansfield, Ohio, the daughter of Henry and Abi (Mitchell) Wilson, the father a native of England and the mother of Canada. In 1836 he joined the Mormons, went west with them and was never again heard of. They were the parents of two children, Sylvia A., wife of Mr. Lyon, and Hannah M., who was born November 29, 1836. The latter was married, first, in Illinois in 1861, to William H. Masters, and secondly to Wilson R. Mason; she now makes her home with Mrs. Lyon. 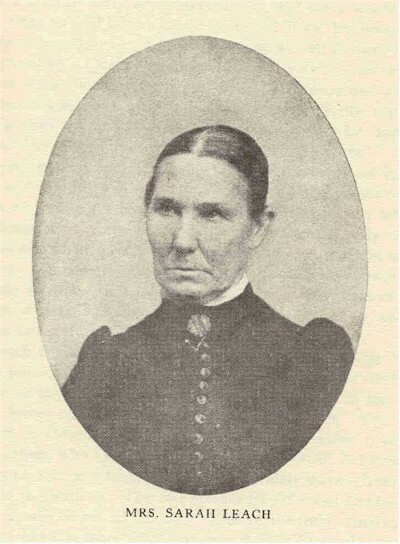 She became the mother of one child by her first marriage, William, who married Hannah Harris; they live in Alden, Iowa, and have one child, Lucy. She also became the mother of one child by her second marriage, Mary, who married George Lane. Since 1896 Mrs. Lyon has lived in Hardin county, Iowa. Four children were born to Mr. and Mrs. Lyon, of this review, namely: J. Arthur, who has always lived at home; William O. died when eighteen years of age; Charles M., who is farming in Buckeye township, this county, married Rachel Houghtailning, and they have two children, Roland and Thelma. Edgar A. Lyon, who married Tillie Swalve, lives in Buckeye township, and they have two sons, John and Ray. When Mr. Lyon first came to Buckeye township, this county, he began life in typical pioneer fashion, putting up a rude hut sixteen feet square. He had no furniture to begin housekeeping with. They ate off a box and sat on nail kegs, and had no beds in which to sleep. But nothing daunted, they persevered, worked hard and finally became well established. They lived in the old house thirty one-years, then built the present comfortable home and made all the other improvements on the place. Mr. Lyon added to his first land as he prospered, and improved it all. Although an invalid for several years and possessing poor eyesight, he succeeded admirably well; however, his wife was compelled to transact most of his business and read to him. At one time they operated a large dairy and kept a good many fine cattle. Mr. Lyon was never an aspirant for public office. He voted the Republican ticket. He was good and highly respected man. Mrs. Lyon is a woman of many praiseworthy characteristics and the possessor of much business ability. She is a member of the Christian church and takes considerable interest in church work, and formerly taught Sunday school. She is well preserved and has kept informed on current topics. Like her lamented husband before her, she has a host of warm friends in this locality. Mrs. Lyon's mother, a noble woman, was twice married, her second husband being Henry Hicks, of DeKalb county, Illinois. He lived there all his life. After 1892 Mrs. Lyon's mother lived with her daughter until her death, in November, 1907, at the advanced age of ninety-one years. She was a faithful Methodist.